Formulated with collagen, biotin and vitamin C, this fabulous blend helps support natural beauty, providing nutrition to promote healthier hair, skin and nails in a once a day tablet. This formula contains Astaxanthin, a powerful, naturally occurring carotenoid pigment that's found in certain marine plants and animals and is recognised as being one of the most powerful antioxidants found in nature offering protection from oxidative stress and free-radical damage. It also helps restore a healthy glow to skin whilst keeping skin supple and nails strong. Made with unique time-release coating, so you can receive nutritional support throughout the entire day. 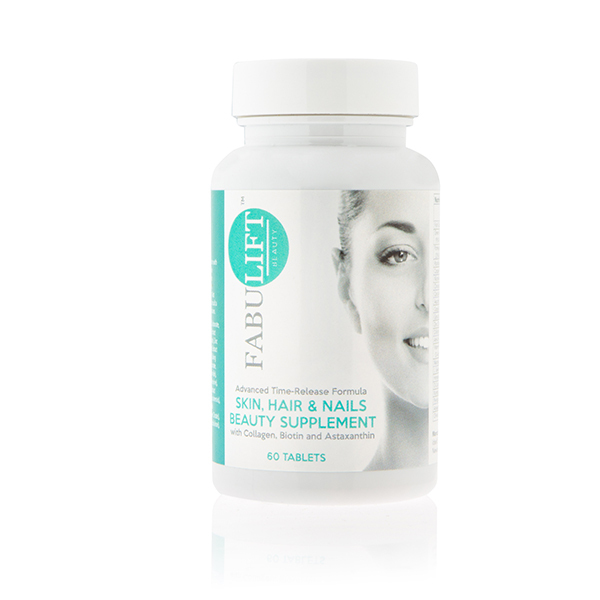 This pack of Fabulift Beauty Advanced Skin, Hair and Nails Supplement includes 60 x 800mg tablets, which equates to a 30 day supply. Riboflavin, selenium, vitamin E, copper, manganese, zinc, and vitamin C contribute to the reduction of oxidative stress. Ingredients: Bulking Agent (Microcrystalline Cellulose), Calcium Carbonate, Vitamin C (Ascorbic Aicd), Marine Collagen, Gotu Kola Leaf Extract (Centella asiatica L.), Glazing Agents (Hydroxypropyl methylcellulose), Zinc Citrate, Vitamin E (D-alpha Tocopherol Succinate), Amla Fruit Extract (Phyllanthus emblica L.), Grape Seed Extract (Vitis Vinfera L.), Anti-Caking Agents (Stearic Acid, Magnesium Stearate, Silica), Manganese Gluconate, Horsetail Stem Extract (Equisitum arvense L.), Vitamin B3 (Nicotinamide), Pantothenic Acid (Calcium Pantothenate), Selenium (L-Selenomethionine), Peppermint Flavouring, Colourant (Red Iron Oxide), Kombu Kelp Extract (Laminairia japonica), Grren Tea Extract 95% Polyphenols (Camellia sinensis), Pomegrante Extract 25% Ellagic Acid (Punica Granatum), Vitamin B6 (Pyridoxine Hydrochloride), Vitamin B2 (Riboflavin), Copper (Copper Citrate), Sweetener (Steviol glycosides), Emulsifier (Sodium Carboxymethylcellulose), Astaxanthin (Haematococcus pluvialis), Biotin, Olive Leaf Extract (Olea europaea L.), Melon Juice Concentrate (Curcumis melo L.).